Welcome to issue 6 of liveartwork DVD, a unique publication showcasing contemporary live art. Issue 6 features a diverse range of text based performance work, ranging from some of the most interesting work in contemporary performance theatre to documentation of a live performance by one of the founders of sound poetry. The DVD has a total running time of about 95 minutes. Scroll down to see more detials about the six artists featured. To get a copy of liveartwork DVD issue 6 click on the 'order' link above. Gerardo Naumann works as a theatre writer and director based in Buenos Aries, Argentina. He has written and directed "Cosas" ("Things", 2002), "¡Sentate! Un zoostituto de Stefan Kaegi" ("Sit! A Zoo Agent" by Stefan Kaegi, 2003). In 2004 he began developing the work "Emily" which was presented in 2006 in a Kitchen Showroom in a suburb of Buenos Aries. In March 2006 Naumann received funding for the development of a film project titled "Uruguay". Emily the story of the life of Emily: a girl who is born, grows and ages. The work is based upon dialogues, scenes or extracted situations from language education books which is transformed back into a language of representation. What happens if the things one imagines become real? What happens if “the real one” is in himself a representation? The fragments of situations, scenes or dialogues structure a totality: the life of Emily a girl who lives in some place of South America and then moves to London. Emily is represented by three actresses ranging in age from 12, 26 and 72 - representing Emily at different moments in her life. When they are not Emily, they represent other characters of different ages and genders. Emily speaks of everything: of earthquakes, of food, scrap iron and frustrated love. Initially speaking in Spanish, the speech changes to because she moves to London, although the subtitles (and surtitles in the original performance) return the language to Spanish, because to be translated is also part of life. Magnus Logi Kristinsson was born in Iceland in 1975 and studied in the Audio Visual Department of the Gerrit Rietveld Academy, graduating in 2003. He then went on to complete his MA in the Time and Space Department of the Helsinki Arts Academy. He is now based in Helsinki. "In the performance I am reading lists of words in alphabetical order from A to Z. Opposite to me I have a CD player playing the same list of words that I am reading - making a composition of my list and the CD player's list." Anders Härm (born 1977, Estonia) is an art critic, lecturer at the Estonian Academy of Arts and a curator working at the Kunsthalle Tallinn, Estonia since 2002. He curated the Estonian national pavilions at the Venice Biennale Architecture Exhibition in 2000 and at the Art Exhibition in 2003. He is a founding member of troubleproductions (together with Hanno Soans) in 2001. He is one of the artistic directors (together with Priit Raud) of the NU Performance Festival which takes place in Tallinn, at the Kanuti Gildi SAAL every two years, since 2005. 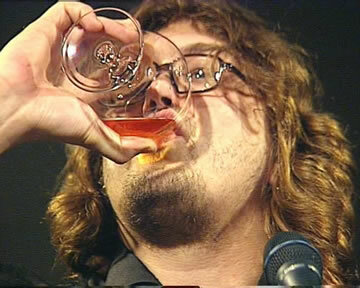 He has created two solo lecture-performances "Be Drunk, Be Very, Very Drunk" in 2002 and "Cooking and Shitting" in 2006. On the back cover of the Slavoj Žižeks book called "Looking Awry" there is a quote from one review stating that Žižek is doing "philosophy as stand-up comedy". This statement attracted me because with the lecture "Be drunk, be very, very drunk" I tried to do the exact opposite, to do stand-up comedy as philosophy. The starting point for this lecture was an offer to participate at a dead-serious conference for dead-serious art historians, philosophers, sociologists etc. It is a context that is always filled with sterile concepts, obligatory quotes and boring talks failing to have any connection with the real world. The lecture was meant to be an intervention into this academic ivory tower trying to shake it a bit. The idea behind it was my personal dissatisfaction with the ways Academia as a construct is killing any creativity while being based on the repetition of overused concepts and thoughts. The lecture is an anecdotal/academic cocktail of ideas, concepts and notions being put together on the basis of pure association. It is illustrated with the extremely funny and idiotic drinking-songs of Baktruppen, a Norwegian performance group to whom I owe eternal gratitude. Between 2002 - 2006 the lecture was presented at festivals such as Baltoscandal in Rakvere, Estonia, HOMO NOVUS in Riga, Latvia and SPIELART Festival in Munich, Germany with a last final performance at the Theatergarasjen in Bergen, Norway in 2006. As an artist my engagement with performance, objects, place and space is entirely transformed through the experience of becoming profoundly deaf over the course of some twenty years. Informed by this radical personal alteration, my art practice takes an interdisciplinary approach. Hence, my artistic projects remain open to innovation according to circumstance and I have explored working with performance, installation, photography, video, sculpture, text, choreography and digital art – often combining elements within one work. In the last ten years I have created performances, publications, installations and artist’s videos in Britain, Europe, Japan, Greenland, China and North America. In 1997 I completed a Doctoral thesis on performance, writing and bodily identity entitled ‘Physiques of Inscription’ at the University of Sussex. My publications include 'Hearing Things' (Bookworks – 2001) and 'A Holythroat Symposium' (1993). I was awarded the Helen Chadwick Fellowship in Rome, 2002, and am currently an AHRC 3 Year Fellow in the Creative and Performing Arts at BIAD, UCE (2004 - 07). I am the Artistic Director of the collective of disability artists, 15mm Films (www.15mmfilms.com). Around the time that Mary Shelley conceived her monstrous offspring in ‘Frankenstein’, Caspar David Friedrich painted his ‘Wanderer Above the Sea of Clouds’. An ‘ubermensch’, he looks down at the sublime landscape from his god-like vantage point ‘above the clouds’. The horizon’s perspective dramatically pierces his torso as he stands leaning heavily on a stick, his shape distorted like a typically-wounded, Romantic hero. I wondered what Friedrich’s Wanderer would look like if he turned round? Would his features reflect an obsession with the sublime, expressing the mystical and lofty thinking which he is often held to embody? Or would he be, unexpectedly, like Shelley’s monster, rabid with animality and foaming at the mouth? In the video work, I/he falteringly turns around, like an artist that has decided to stand face-on, rather than behind, the camera / canvas. 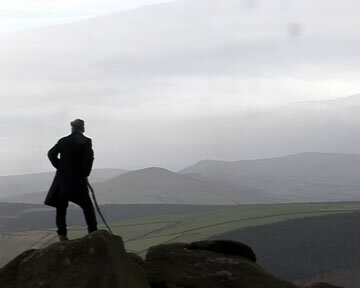 The Wanderer is Friedrich/ me, the artist himself. Whereas Friedrich painted this image in a portrait-shaped frame, in my video I have initially returned the figure to landscape as if to reduce the scale of his importance to it before moving into close-ups. As the camera telescopes in and then out, the wind blows flecks of foam from the continuous stream emerging from his mouth onto the mountain, like some forlorn frond-like seed. He pauses portentously, yet pointedly refrains from speaking before turning slowly back again to marvel at the view he is now a part of, as inseparable from it as any other creature. 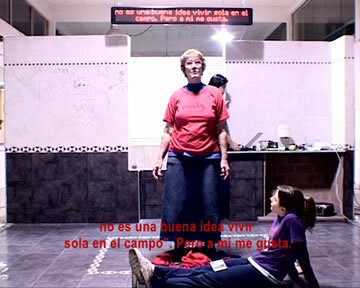 Originally presented as a 10 minute live performance at the Hayward Gallery, London in 2006. Edit Kaldor was born in Budapest and studied literature and drama in New York. Between 1993 and 2000 she collaborated with Peter Halasz (Love Theatre) as a dramaturg and video artist. Currently she lives and works in Amsterdam and Brussels, producing theatre performances that often integrate various forms of digital media. 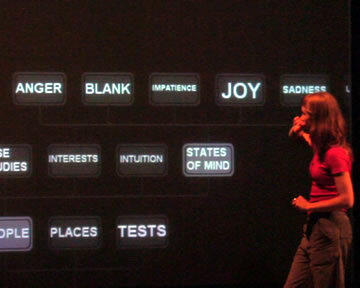 After studying at DasArts (Amsterdam) she had a breakthrough with the solo performance "Or Press Escape" (2003) in which the narrative is constructed by means of the daily use of a computer. In "New Game" (2004) she tried to transpose the format of the computer game onto the stage. For "Point Blank", Edit Kaldor invites the 19-year-old Nada to present a selection from her several thousand photographs of real-life situations, taken in secret. The focus of Nada's interest is to trace the various life strategies that people deploy. Driven by this curiosity, she captures in her photos a wide range of human behavior. The performance provides Nada the occasion to organize her collection. Together with the audience she'll watch and contemplate her pictures in an attempt to get an insight that can serve as a manual for life. Production: WP Zimmer Antwerp, Production House Rotterdam and Kata Amsterdam. Coproduction: KunstenFESTIVAL desArts (Brussels), P.S.122 (New York), Sophiënsaele (Berlin). Born in Paris in 1928 Bernard Heidsieck graduated from the Istituto Politico and is the former vice-president of the Banque Française du Commerce Extérieur in Paris and former president of the Commission Poésie at the Centre National du Livre. 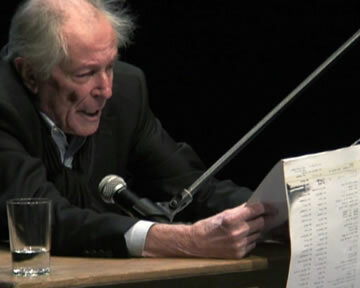 He has been involved in sound poetry since 1955 when he wrote the first "Poèmes-Partitions". He later went onto use of the tape-recorder as a means of composition and retransmission. He organised the first international festival of sound poetry in 1976 and the event "Rencontres Internationales 1980 de poésie sonore" which took place at Rennes, Havre and at the Pompidou Centre in Paris. "Heidsieck sees his sound texts existing within the domain of 'a ritual, ceremonial or event'. The day to day is appropriated and animated to make meaningful 'our mechanical and technocratic age by recapturing mystery and breath'. 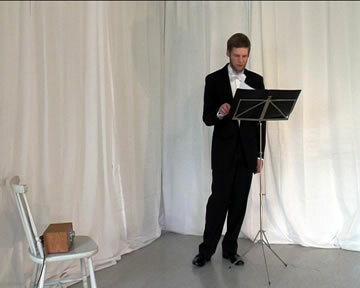 He incorporates taped-text within the context of live performance and plays off his own live voice against his recorded voice. Since 1969 Heidsieck has called his tape compositions 'passe-partout' viz. universal pass keys."